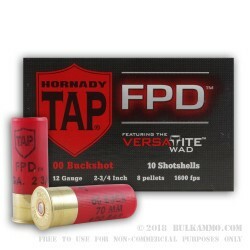 Hornady TAP shells are designed specifically for tactical use by law enforcement officers and people defending their homes and families. TAP shells produce low muzzle flash to enhance the shooter’s follow-up capabilities. 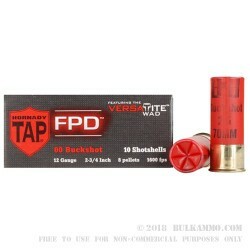 This does not come at any cost in firepower, though; on the contrary, TAP shells fire 8 pellets of 00 buck at 1,600 feet per second, about 20% faster than most other shotgun ammo. 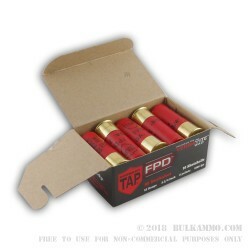 This box contains 10 shotshells, each of which uses Hornady’s Versatite wad for superior patterning. Based in a 150,000 square foot headquarters and production plant in Grand Island, Nebraska, Hornady manufactures high quality loaded ammunition and components. 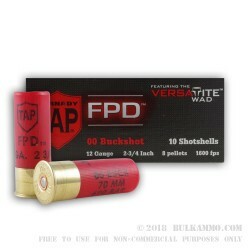 The company got its start making premium hunting and self-defense bullets, but moved into the loaded ammo market to take advantage of its deep product development knowledge and proven R&D capabilities. Hornady shotgun ammunition, although generally slightly more expensive than its competition, is known for its superb performance characteristics, particularly in the areas of accuracy and power.